Castles have always fascinated me as they always make me wonder about the people who have lived there and their lavish life styles. So I was really excited to visit the Windsor Castle. 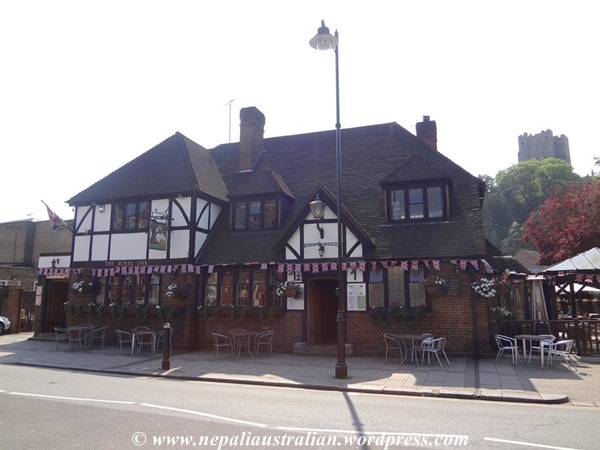 We hired a car from Brighton and with the help of a GPS navigator, we reached the Windsor castle. Unfortunately finding parking proved to be more difficult than expected but we did manage to find parking next to the train station. It was funny to see that the parking meter didn’t take any cash but only card. Luckily, we had one but there were a few other people who didn’t know what to do as they had only cash. 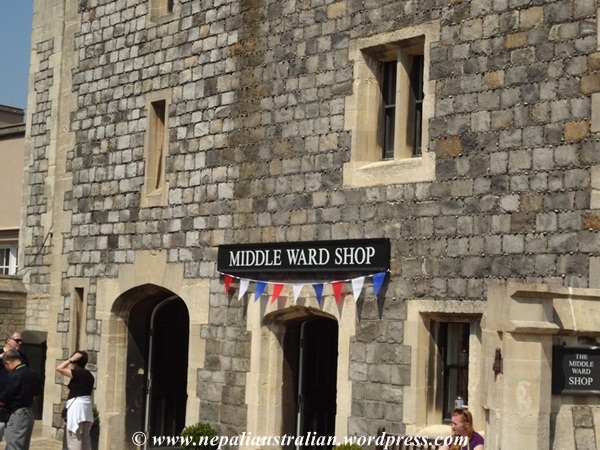 We then took a short stroll toward the Windsor Castle. As soon as we saw the main gate, we realised that there was a long queue for the tickets. I was bit worried as we wanted to do more than one place in one day. Fortunately a guard came and asked us if we were with a group. I told him that it is only the two of us so he asked us to follow him and to join the shorter queue inside as we had unknowingly joined a queue for groups. So in next 10 minutes, we bought our ticket and we were inside the castle. The tickets cost 17 pound per adult. Windsor Castle is a medieval castle and royal residence in Windsor in the English county of Berkshire, notable for its long association with the British royal family and for its architecture. The original castle was built after the Norman invasion by William the Conqueror. Since the time of Henry I it has been used by a succession of monarchs and is the longest-occupied palace in Europe. The castle’s lavish, early 19th-century State Apartments are architecturally significant, described by art historian Hugh Roberts as “a superb and unrivalled sequence of rooms widely regarded as the finest and most complete expression of later Georgian taste”.] The castle includes the 15th-century St George’s Chapel, considered by historian John Robinson to be “one of the supreme achievements of English Perpendicular Gothic” design. 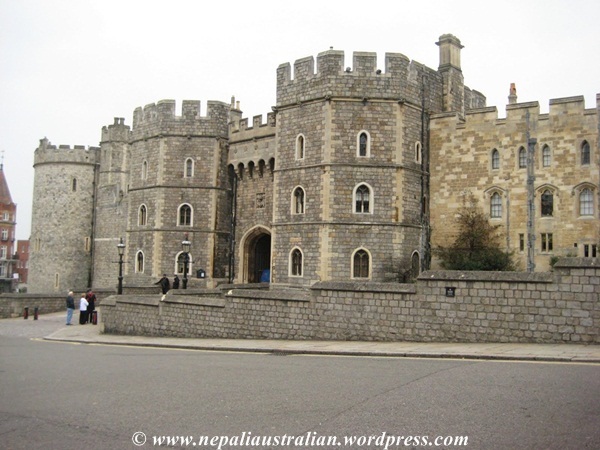 More than five hundred people live and work in Windsor, making it the largest inhabited castle in the world. Inside, in one corner they were handing out a free audio guide so we grabbed them and walked in. After a short wander through the St. George’s gate then onto the Middle Ward, bailey formed around the motte or artificial hill in the centre of the ward, we could see a great view of the Castle complex. We took lots of photos there as that is what I had always seen in pictures as Windsor Castle for a long time. As we were taking the photos, we saw a few guards walking past us and we joined hundreds of people trying to take a photo of the guards. We wandered around for a while and decided to go inside St George’s Chapel and have a look around. There are lots of tombs of many Kings and Queens buried there as well as many noble men. 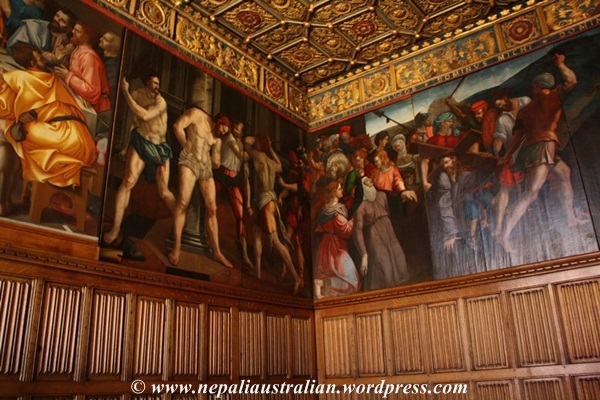 The chapel is located in the Lower Ward of the castle, which is one of the principal residences of Queen Elizabeth II. The most famous tombs must be of King George V and Queen Mary. They are beautifully decorated and we can see the history of arts of centuries. In one of the side aisles, there is a memorial of Queen Elizabeth II’s parents (George VI and Elizabeth, the Queen Mother) and her sister, Princess Margaret. 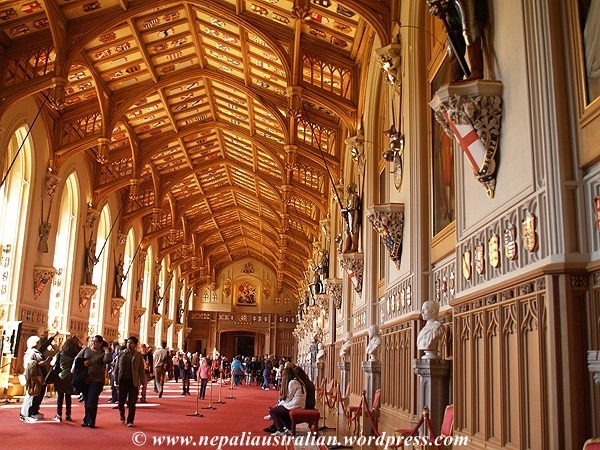 In this chapel, The Prince Edward, Earl of Wessex and Sophie Rhys-Jones were married in 1999 along with many other royals .Also Prince Charles and Camilla Parker-Bowles had a blessing at St. George’s Chapel after their civil ceremony in Windsor. Then we headed to view Queen Mary’s Dolls house. Unfortunately, there was a long queue so we decided to skip that and instead went to the State Apartments. The Queen was not there so we were allowed to go in. The State Apartments are amazing and was very huge. As the self-guided audio tour took as to many rooms, it explained about its history and they were really fascinating. 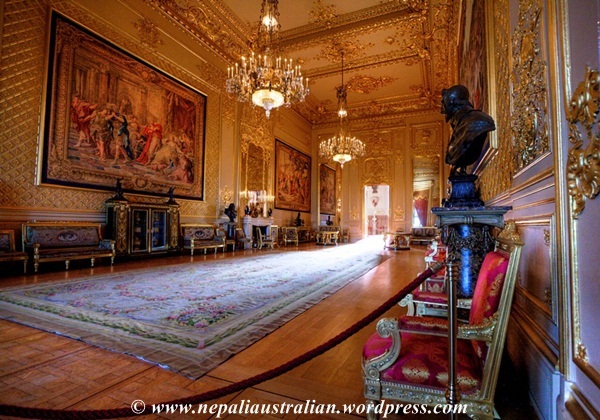 The rooms we were allowed to go into were the King’s Drawing Room, the King’s Bedchamber, the King’s Dressing Room, the Queen’s Drawing Room, the King’s Dining Room , the Queen’s Ballroom, St. George’s Hall Paintings and the Lantern Lobby . 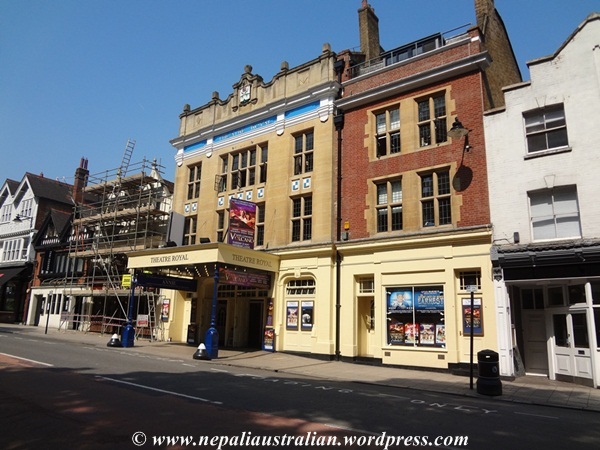 I also came to know that they were completely gutted in a fire in 1992 then subsequently rebuilt. There were lots of artworks and many by Van Dyk, and also a self-portrait by Rembrandt. Then there are rows in the wall full of family portraits of the royal families from many centuries. Also in some rooms there were lots of other priceless pieces from the years ago including guns, swords, crowns from everywhere in the empire as well expensive china dinner sets, clocks. There were also displays of shields of the previous knights of the garter AS was so interested to look in detailed in this room; I literally had to drag him away from there. If you look into detail, you can spend the whole day in the castle but we didn’t have so much time so we had to go around quickly. 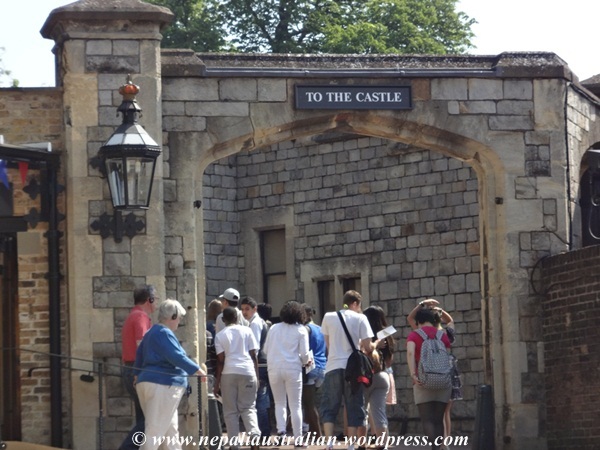 It was a really nice and sunny day for our visit to the castle and it was fun to go inside the rooms and walk the pathway which had been walked by famous kings and queens including Queen Elizabeth II. There was also a post box of royal mail where we took photos. From there we made our way to the exit and handed over the audio guide. Outside the castle we saw two police officers equipped with big guns. The palace itself was surrounded by small period houses and looked beautiful. This entry was posted in England, Travel and tagged Brighton, british royal family, King's Drawing Room, Lantern Lobby, Queen Elizabeth II, Queen Mary’s Dolls house, St George’s Chapel, St. George's Hall, State Apartments, the King's Bedchamber, the King's Dining Room, the King's Dressing Room, the Queen's Ballroom, the Queen's Drawing Room, Windsor castle. Bookmark the permalink. Yeah, I guess when they were building castles there were no cars around so they skipped the parking aspect all together Such a short sighter people & they still made it into the history 🙂 . Such history, and I’d be in awe. There is and so much back stabbing in history as well. I love castles too. In Germany we have a lot of castles and palaces. 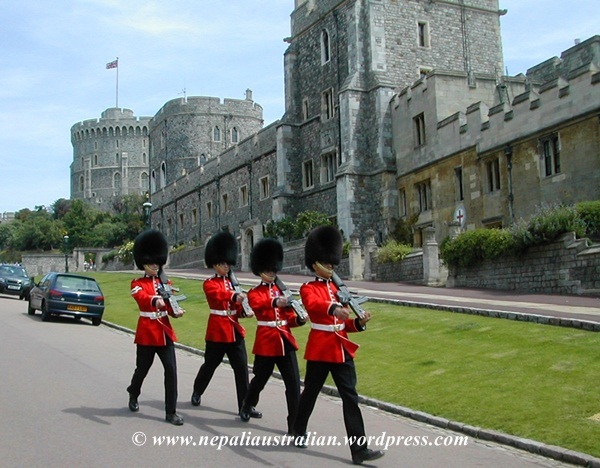 About 15 years ago I was in Windsor castle too, that time the entry fee was about 10 DM ( 5 Euro). In every corner from the castle you can to sense the old history.It’s one of the amazing castle in europe.